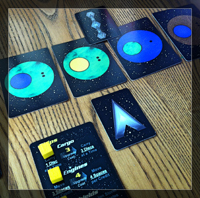 A space trading card game for two players. Travel to a remote section of space and trade exotic spheres between alien planets. Try to make the most money before the wormhole appears and drags you back home. Each play has unique strategy determined by the random layout of the planets, and you have to plot your ships moves carefully to achieve maximum efficiency.